Gervais’ beaked whales are known to reach lengths of up to 5m and weights of more than 1000kg; females are usually larger than males. Newborns are probably about 2m long. Life span is unknown for this species, but it can be, at least, 48 years old. 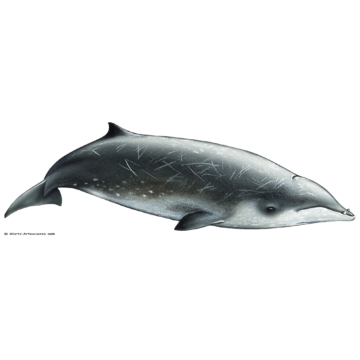 Gervais’ beaked whales are characterised by a spindle-shape body, small head, and small dorsal fin located about two-thirds of the way back from the snout tip. The beak is somewhat short, and blends smoothly into the forehead. The triangular teeth of the mature males are found one-third of the distance from the tip of the lower jaw. The mouthline is relatively straight. Typically, like other mesoplodonts, they are dark grey above and lighter grey below. Although the body of adult individuals can present scars, they are usually not heavily scarred. There is often a dark patch around the eye that seems to be more pronounced in this species compared to other beaked whales with similar colourations. Like other members of the genus, Gervais’ beaked whales are known to feed mostly on squid, although some fish may be taken as well. Nothing is known about the social structure of this species as it’s one of the least seen beaked whales species in the wild. However, when correctly identified, they always seem to be in small groups (3-5 individuals). Most records of this species seem to indicate that they are limited to the North Atlantic, however, they are probably distributed in deep waters across the tropical and temperate Atlantic Ocean. In the North Atlantic, it may be nearly impossible to distinguish them from True’s beaked whale (Mesoplodon mirus), if no adult males are present. Only a very detailed view of the head would allow identification based on tusks shape and position. Although it’s not easy to approach and see beaked whales, this is a species that we find every year on sporadic sightings through the season. They have been observed from April to September, but there is a peak in the sightings in June and July.